As a child growing up in Mexico, Upward Scholars student Elizabeth relished the time she spent helping her mom repair her siblings’ clothes. Now she’s primed to parley her passion for sewing – and fashion – into a career. 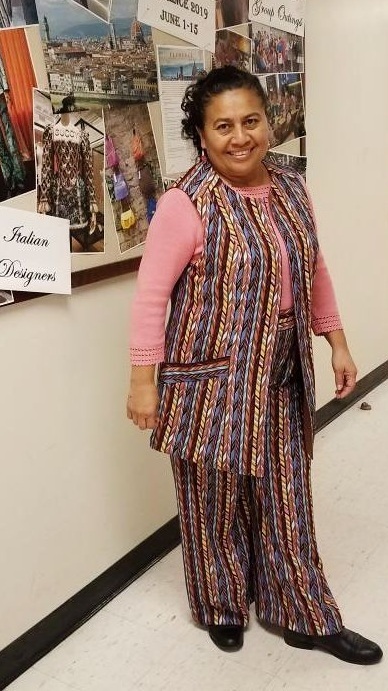 Last semester Elizabeth – having completed all but two of Cañada College’s required ESL classes – enrolled in Cañada’s introductory fashion design class. Elizabeth (above) and Blanca (below) model their final projects for their Beginning Clothing Construction class. Photos courtesy of Diana Espinoza-Osuna. Unlike Elizabeth, Upward Scholars student Blanca came to the United States from El Salvador with extensive sewing expertise. At 16, she started working as a seamstress for a high-end dressmaker; at 20, she quit that job and opened her own tailoring business. Blanca came to the U.S. 20 years ago. In addition to taking classes, raising a family, and working full-time as a cashier, she runs a small seamstress business out of her home and also teaches sewing. The cost of Elizabeth and Blanca’s book are covered by Upward Scholars. Blanca receives a monthly bus pass from Upward Scholars and Elizabeth has received a laptop. And they both meet with Upward Scholars tutors who, while experts in teaching ESL, have greatly expanded their knowledge of sewing! Blanca and her tutor, Kate Hand,during a tutoring session. Photo courtesy of Peter Hand. Elizabeth and her tutor, Susan Russell, at the 2018 Upward Scholars Tutor/Student Picnic. Photo courtesy of Mary Bender.